Van de Weghe Fine Art is pleased to present an exhibition of works on paper by Jean-Michel Basquiat. Assembled over the course of the last twenty years, the works form the basis of a remarkable single private collection, and illustrate the wide range of subject matter and modes of expression employed by the artist over his short but intensely-lived career. 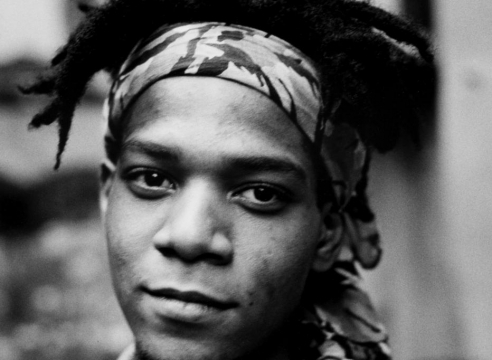 Among the most important American artists of the latter half of the 20th century, Basquiat began his career circa 1980 at the age of 19. A self-taught East Village graffiti artist who quickly became a superstar of the art world, his story was chronicled and made more famous yet by fellow 80s artist, Julian Schnabel, in his 1996 film Basquiat. The fame and infamy surrounding Basquiat does not obscure or detract from the raw strength and historical significance of the work itself, however. In spite of the artist’s death in 1988, he was extremely prolific and there is a seemingly endless depth and breadth to his output. Basquiat’s works on paper are notable for their remarkable range of media, incorporating oilstick, crayon, acrylic, pen, pencil and watercolor with equal aggressivity and expression. Indeed, drawings existed for Basquiat as an important means of expression in their own right and no less significant an art form than painting – a constant creative activity for an artist who was continually concerned with blurring the hierarchy among mediums. Basquiat’s work is intensely charged on the one hand by strong color and gesture and on the other by a rich lexicon of iconography and symbolism: an expressionist sensibility matched with Pop intellect. Whether pictures of heads and full-frontal figures, depictions of street life and his surrounding environment, or allegories of black musicians and athletes, he never abandoned the centrality of the human figure as a means for expressing a moral foundation in his art.